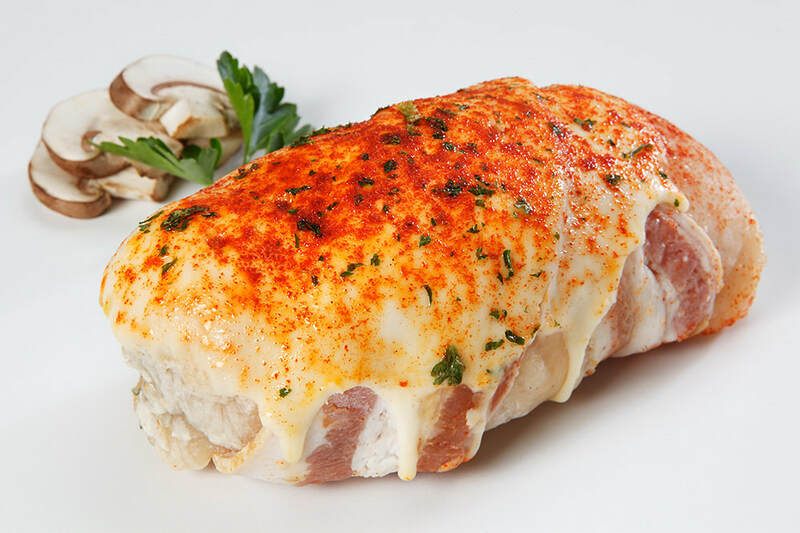 Boneless & skinless chicken breasts are neatly hand trimmed of excess fat and skin then marinated with water and salt to make the chicken moist and tender when cooked. Fresh sliced button, crimini, and portobello mushrooms are sautéed with fresh diced onions, butter, madeira wine, brandy, salt, and black pepper until just soft. Once the mixture is cooled, it is blended with imported parmesan cheese, half and half, chopped parsley and basil, and panko breadcrumbs. The chicken is hand stuffed, wrapped with two slices of bacon (criss crossed over the stuffed chicken breast) and frozen. The chicken breast is finished by garnished. Thaw chicken breasts in a refrigerator. Preheat oven to 375°F. Place chicken breasts onto a pre-greased or foil lined baking sheet. Bake for 35-45 minutes or until internal temperature reaches 165°F as measured by a thermometer.